Trans-inclusive bathrooms aren't hurting anyone. Discrimination, on the other hand, is. Photo by Jessie Daniels. Yesterday, North Carolina’s governor signed into law an appalling piece of legislation: a bill that bans transgender people from using public restrooms that match their gender and makes it illegal for cities in the state to pass anti-discrimination bills that protect LGBT people. The governor and the Republican-held legislature advocated for the bill on the platform that it prevents violence. Backers of “bathroom bills”around the country have sold them with false rhetoric that portrays transgender women as potential rapists. Republicans argue that these pro-discrimination measures are essential to public safety. But actually, they contribute to violence. It’s worth repeating that the kind of transgender bathroom assault Republicans discuss in their votes for these measures has never happened—there are zero reported cases of this happening anywhere in the United States. Media Matters did an analysis of 12 states that have passed anti-discrimination measures affirming the legal right of transgender people to use the bathroom that matches their gender in public buildings. Some states have been banning discrimination in public accommodations since 1993. The analysis found that in those states—including Oregon, Colorado, Connecticut, Iowa, Nevada, and others—law enforcement officials had universally not seen a single report of assault perpetrated by trans people in restrooms. What is real and documented violence is the harassment and assault of transgender people. According to a 2013 Williams Institute report, about 70 percent of trans people have reported being “denied entrance, assaulted or harassed while trying to use a restroom.” The physical assaults trans people reported included people removing them from the bathroom; being hit, kicked or slapped; being physically intimidated and/or cornered; and in one case being sexually assaulted. The stress and danger caused by a lack of antidiscrimination protections in bathrooms can have a huge impact on transgender people's’ lives. One person surveyed in the Williams Institute report said problems accessing her school’s bathroom caused her trouble in school—she had to change schools and then finally dropped out due to problems with restrooms. North Carolina’s bill is clearly unconstitutional. Last year, the Obama administration made clear that transgender people are protected from discrimination under the Civil Rights Act. Sadly, the issue didn’t die there. Thanks to the Republican campaign to politicize bathrooms, we’re sure to see more bills like North Carolina’s work their ways through legislatures and the courts. 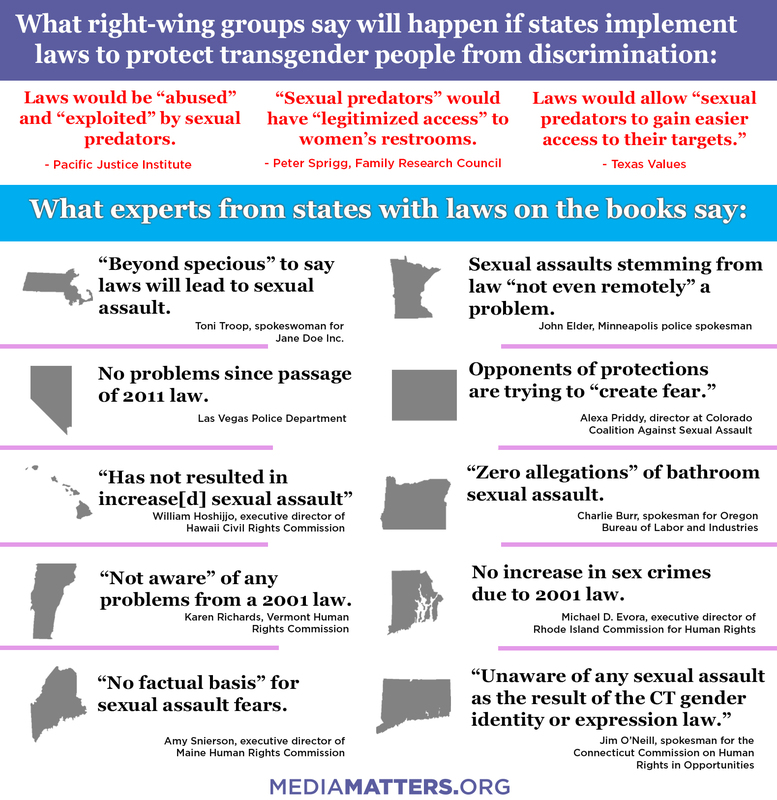 Even if they’re all eventually overruled, the debates around these bills contribute to a false image of transgender people as dangerous sexual predators. That hurtful stereotype reverberates through every part of life. As the National Transgender Discrimination Survey report showed, 63 percent of trans people “had experienced a serious act of discrimination” in their lifetime. That is the real-life violence legislatures should be working to address instead of pushing policies based on nothing more than hateful myths. Related Reading: Under Federal Law, Public Schools Can't Legally Discriminate Against Trans Students. An asexual author got tired of not seeing asexual characters in YA books. So she decided to write her own series.